Old Guys and a Mom-to-be: Will these tennis greats ever retire? The French Open is in full swing and what a tournament it has been so far! Rafa has sailed through to the semis and yesterday we saw Djokovic knocked out by 6th seed Thiem. 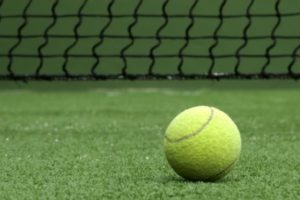 Today sees the second day of the Men’s Quarter Finals, which will decide the fate of both Murray and Wawrinka, and the Women’s Semi-Finals are all set for tomorrow. Bring on a weekend of tennis! 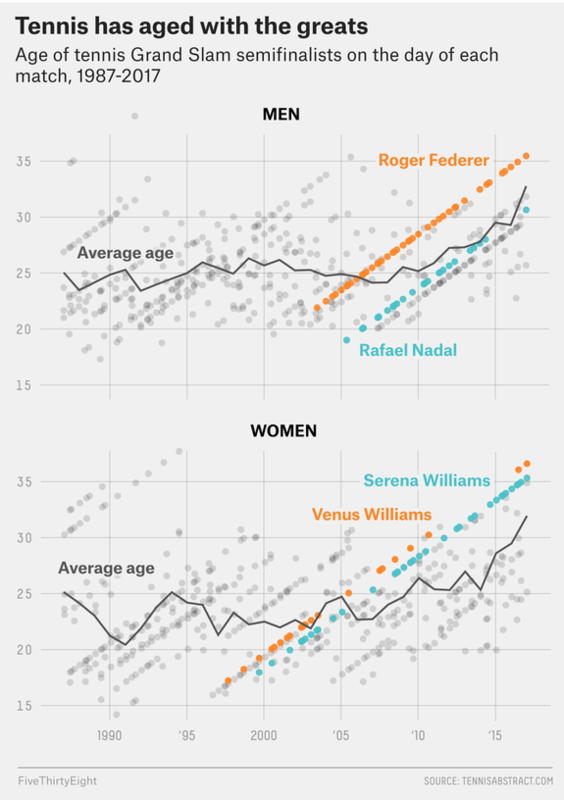 The chart below, from the same article, shows just how impactful Serena, Venus, Roger, and Rafa have been on the “age” of tennis. The age of tennis players in Grand Slam Semifinals has gone up and up more or less since they started their careers, growing older alongside them. And what incredible careers they have been: Serena, aged 35, has won 39 Grand Slam titles, 4 Olympic gold medals and is still competing at the top level, winning the Australian Open in January this year. Her older sister, Venus (36), has won 23 Grand Slam titles, 4 Gold medals and is still ranked as no.11 in the world, losing to Serena in this year’s Aussie Open Final. Rafa and Roger’s stats are just as insane, with 32 Grand Slam Titles between them and 3 Olympic golds. Roger most recently won the Australian Open in January at the age of 35 and is a firm favorite to win Wimbledon this year. How each of them continues to perform at this level is something the sports had not seen before. The average professional tennis player’s career is 16 years (ResearchGate) – Serena and Venus have been WINNING Grand Slams for 18 and 17 years respectively, and Rafa and Roger have been winning for 14 and 12. One potential explanation for their incredible longevity is an increased focus on diet, conditioning, and scheduling; just now we have seen Roger choose not to play in the French Open as he feels it will up his odds of winning Wimbledon next month. And tactical decisions like this may become more and more important due to his age. 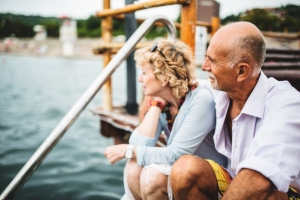 Off the tennis court, we have seen a similar aging pattern with the average American expecting to retire later and later in life. 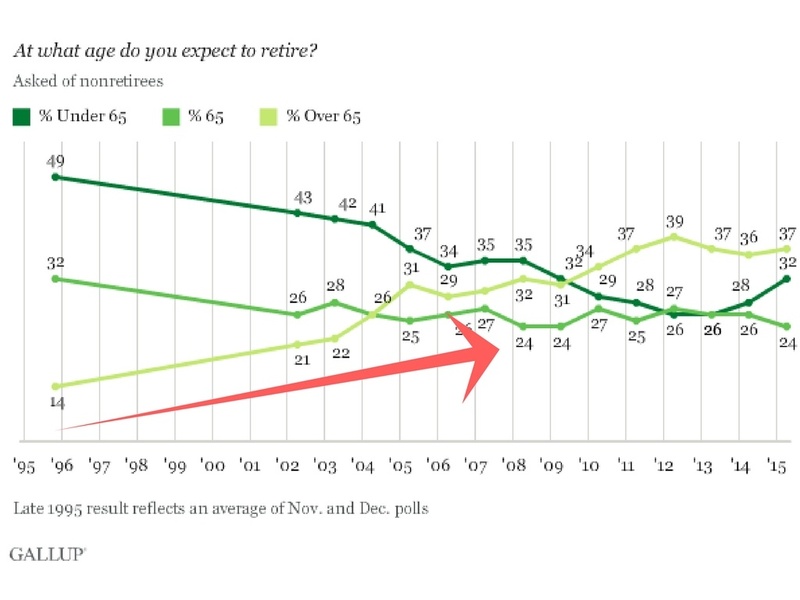 As the chart below from a Gallup poll shows, in 1995 only 14% of Americans expected to retire after 65 years old; in 2015 however, 37% of Americans expected to retire after 65. One suggested reason for this trend is that people are living longer and thus are retiring later in life. Another explanation is that, unlike Rafa and Roger, delayed retirement is not by choice, but rather because Americans cannot afford to retire by 65. 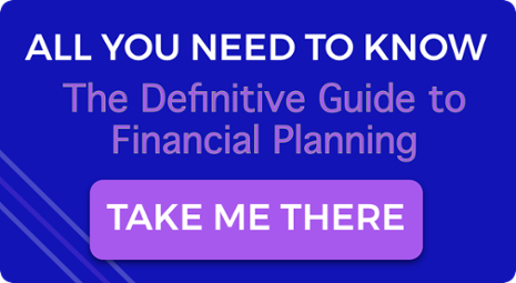 It’s a good reminder that the earlier you start saving and investing towards your retirement, the sooner you can work by choice, instead of necessity. 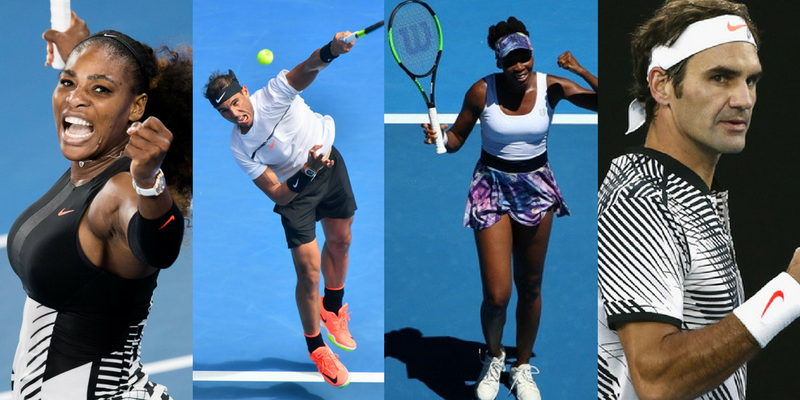 It remains to be seen whether Serena, Venus, Roger, and Rafa continue to break records as they creep closer to 40, and whether Serena will be able to join another elite club of women who have won a Grand Slam as moms. 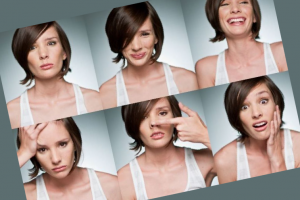 But no matter what happens, they are all living proof that age REALLY doesn’t matter as much as it used to – unless you’re a wine or a cheese.